To say that I felt excited when I was creating this cake just doesn't cut it. The Simpsons has been a much loved cartoon throughout my childhood, my teenage years, and still now as an adult. The timeless comedy has amused both the young and the old since 1989, it would be difficult to find another cartoon in the same league. Because of this, I was actually a little hesitant in accepting this order. The pressure to do the Simpsons justice, I almost couldn't do it. For me personally, I have yet to find a 3D Simpsons character out there that I feel, looks entirely true to the 2D characters that we all know and love. 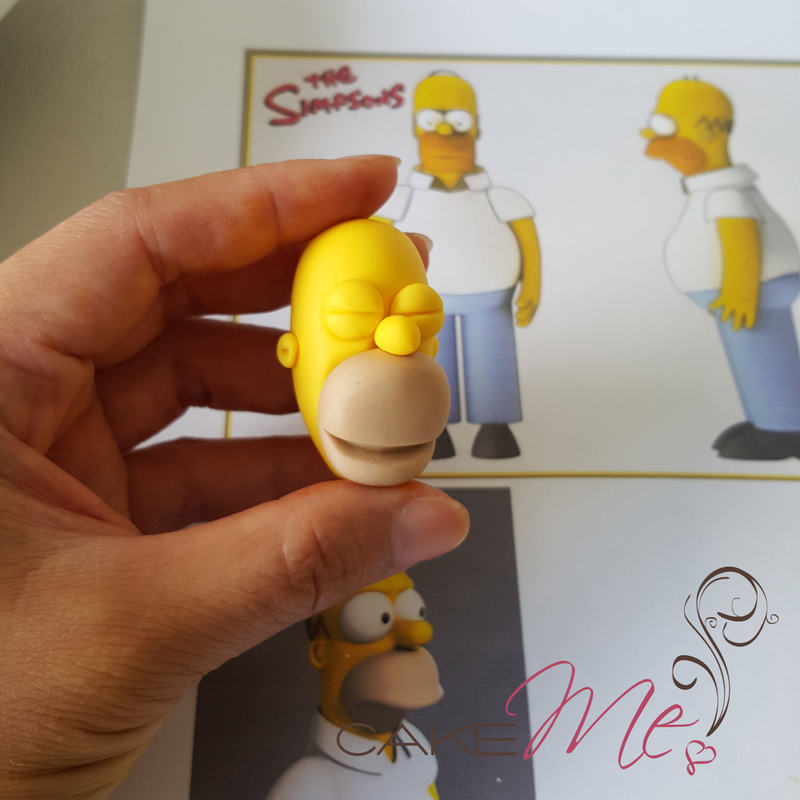 Especially not a 3D Simpsons character created with fondant. Everyone knows exactly how the Simpsons characters look, and a nose out of place or one finger too many, can cause die-hard fans trolling. Because of these reasons, I was really hoping that our client would change her mind. But there was no chance, our client insisted on having a Simpsons themed cake for her boyfriend as he REALLY loves the Simpsons. Even though I tried my best to deter her from the Simpsons, she was so determined to have a Simpsons cake that she was willing to have "anything-Simpsons-related", and trusted us to create her dream cake. It was because of her persistence and determination that we agreed and decided to give it a try. I was so glad that we accepted the challenge as I loved every moment of it. From designing the cake and running my ideas by my client (who was always enthusiastic and lovely to deal with! ), googling images from the actual TV show, to sugar sculpting the toppers and finally putting the scene together on the cake. When we agreed to do the cake, there was no question, it had to be Homer. Full of character, personality, habits, he would create an awesome scene. The setting also needed to be well known, so either the front of the house, or the lounge room, and there would need to be beer. Alot of beer. So I got googling. I was ecstatic to find the image of Homer, passed out with a part-eaten donut in his hand. Of course, there has to be donuts! Then I found an image by someone named "Ben", who drew the exact scene I wanted to recreate. Some of the aspects of that image didn't seem to be exactly how Matt Groening draws, so I combined Ben's scene with Matt Groening's masterpiece. I started off with sugar sculpting the couch, and when I was happy with how it turned out, I started on Homer's head. I placed him on the couch. Gasp. Shock horror... His head was almost a third of the size of the couch. Do I redo Homer's head from scratch, or do I make an entirely new couch? I chose the couch. So after a new couch was sculpted, this time in proportion to Homer's head, we were able to sculpt the rest of Homer's body, and then add all the finer details, including his signature white Y-fronts. As the birthday boy's name is Alvin, we decided that it would be most fitting to brand his jocks after him. Creating the rest of the scene, the beer cans, donuts, rug, lamp table, complete with lamp, books and phone was just pure enjoyment. Finally, for the side of the cake, I really really wanted to recreate the outside of the Simpsons house, yet at the same time, I wanted to do the Simpsons introduction sky theme. After speaking to my client and hearing that she was planning on decorating the party with clouds, the decision was made. So there it is, our Homer Simpson cake for Alvin (Klein), complete with a fondant 30 donut! Happy 30th birthday Alv! If you've enjoyed reading about the making of our Simpsons cake, please subscribe to our blog!